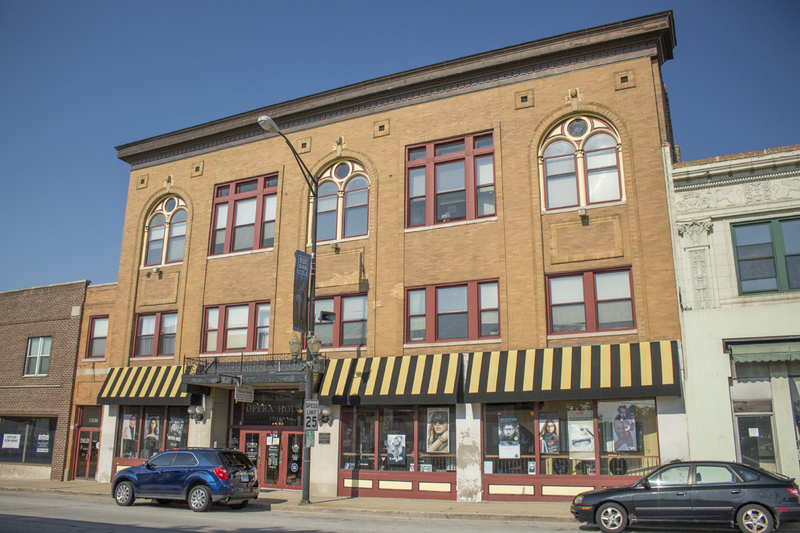 The Blue Island Opera House, built in 1908, offered vaudeville style entertainment when it opened. The city of Blue Island, Illinois, (population 24,000) sits on a glacial bluff that rises out of the prairie south of Chicago. The thickly wooded crown of the ridge appeared to float in a sea of blue wildflowers, giving the town its name. Blue Island is one of the oldest communities in Cook County. In 1835, the settlement was a stop along the Vincennes Trail, an old Indian trail connecting Fort Dearborn with Vincennes, Indiana. The community experienced an early flurry of activity in the 1840s during the construction of a feeder canal (now the Calumet Sag Channel), which is now an integral part of the Illinois & Michigan Canal National Heritage Corridor, established in 1984 by Congress. In the 1860s, brick factories and railroads bolstered employment and growth in the city. During the famous 1894 Pullman Strike, riotous railroad workers and brick makers toppled cars and jeered at strikebreakers, prompting a federal injunction and suppression of the strike nationwide. On July 4, 1894, the Fifteenth U.S. Infantry arrived in Blue Island and imposed martial law. The troops were stationed outside the local Rock Island Depot, which still stands in Blue Island today. The Old Western Historic District in Blue Island contains the home of the town’s first settler, Stephen Jones, and one of the first hardware stores in the city, still in business after 100 years. Recently the Guildhaus, an alcohol and substance abuse rehabilitation center, received a grant from the Historic Preservation Commission to improve structures on Old Western Avenue, restoring and improving facades to resemble early 20th century storefronts. A walking tour of Blue Island takes visitors past historic homes, commercial buildings, and an 18th century Indian battle site. The Blue Island Historical Society museum has a large collection of local artifacts, records, photos, and memorabilia.